Is Google Latitude Anticipating Your Travel Plans? 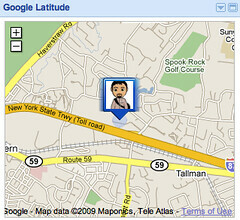 Home > Google News > Misc Google > Is Google Latitude Anticipating Your Travel Plans? Yesterday, my brother-in-law called me and asked me where Google Latitude was showing him as being. I looked at iGoogle and loaded up his profile to see that Google Latitude put him in Florida, at Fort Lauderdale-Hollywood International Airport to be exact. He told me, he was in Newark Airport, in New Jersey, waiting to board a flight to Florida, to go to that airport. He asked me if Google uses Gmail data to figure out that he will be in Florida soon. He thought that maybe, Google read his emails and figured out that he will be in Florida at this time. I said, there is no way that this was possible. It must be a bug. I quickly asked him to go to ShowMyIP.com and read me what he saw. He said, the ISP data come back as being in Newark. At that point, I figured it was likely not the Wifi network reporting back as being in Florida. I still dismissed it as some weird bug and told him not to worry that Google is anticipating where he will be based on his personal emails. There is no doubt there have been many many reports of Google Latitude showing people at the wrong location. The accuracy of this stuff is not perfect, so it is possible. But still, to show the airport of where he will be in the next few hours, well - that is a bit creepy. I guess it is possible Google mapped certain ISP locations in the wrong location. Google has reported this bug over and over again and has asked to be notified via the forums if this is a problem, so they can fix those mappings. - Background sharing is not currently working on Windows Mobile phones when closing Maps for mobile and choosing 'Yes' to allow background sharing. This is a known issue and is being fixed for the next release. - If you leave Maps for mobile open in the background by minimizing it or opening another app, location updates will continue as long as your phone is awake. But still, what are the chances of Google showing an airport that my brother-in-law will be at in the next few hours, even when he wasn't there yet? Pretty crazy.